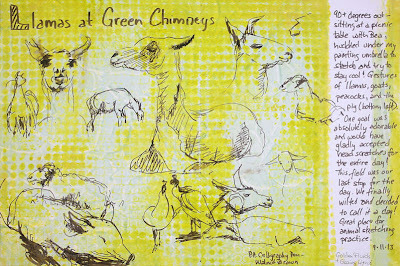 My plein air group went to Green Chimneys today, which is a residential facility for children. Their philosophy is that children benefit greatly from caring for and interacting with animals. They have a wonderful farm on the campus. Many of the animals here have been rescued and are in the rehabilitation process, not so unlike the children that reside here. It was over 90 degrees today, and you'd never know we were into September. Due to the heat and my love of the animals, I decided to spend the few hours there sketching instead of working on a single painting. Of course the animals were in constant motion, so the sketches were gestures, done as they moved about. The sketch above (which you can click on to enlarge it), was actually the last one of the day. It was done across a two page spread of an 8.5x11" Stillman and Birn Zeta hardbound book, which gave me a full 11x17" work area. This is extremely heavyweight paper (180lb) and is fabulous for multi-media work. I've been using a large Gelli Printing Plate to print textured layers of color across the pages. I've done it in both Zeta and Epsilon books. I love having a toned, textured ground to sketch against, especially when working in monochrome. I sketched with a Faber Castell Pitt Calligraphy Pen. I wished I'd brought a bunch of Pitt Brush Pens with me, but alas, I did not. Above is a two page spread in a smaller Zeta book, without a toned ground. The book is 5.5x8.5", which gives me a letter-size space when working across the spread. 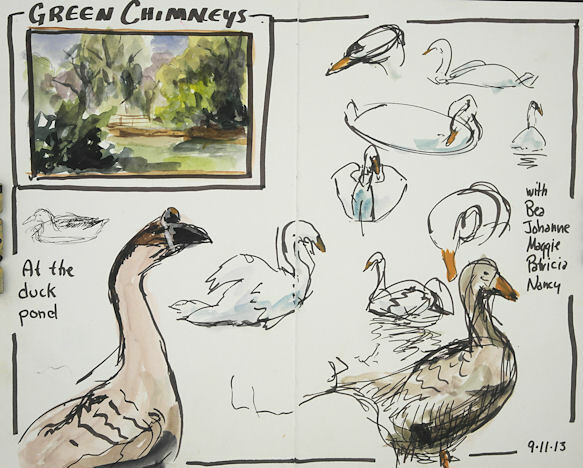 When we first arrived at the location, we gathered near a small pond filled with several different types of ducks, geese, and some beautiful swans. They were all highly entertaining! I started out with the little watercolor thumbnail sketch of the pond scene, then did some gesture sketches of the geese and swans, using the same Walnut Brown Calligraphy Pen, and a little watercolor. I got tired of the brown and wanted to work with a brush, so for the sketch above, I pulled out a Pentel Aquash Grey (or maybe Light Black?) brush pen, plus my Kuretake brush pen, which was filled with Platinum Carbon Black ink. I added orange gouache for the beaks and cerulean blue watercolor for the shadows. I liked these two gestures. The goose on the left kept ducking his head down into the water to drink, then would raise it way up. Every time he stretched his neck and head up, I put in a few more lines! 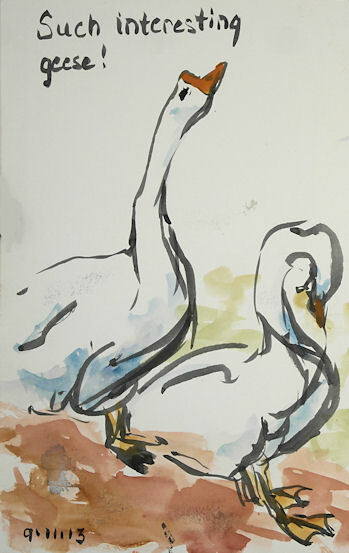 My friend Bea called me over to the other side of the pond to witness some swan antics. One kept swimming back and forth in front of me. 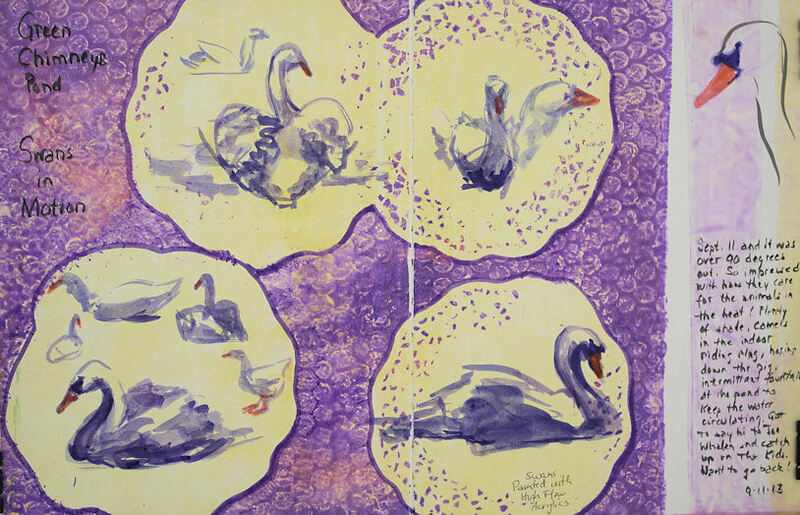 I found this page that I'd printed using paper doilies on the printing plate to keep some clear areas, and decided to put the swans there. I worked on several views at once, changing from one to the other as he changed direction, swimming around in a circle. I mixed a violet out of some of the new Golden High Flow Acrylics, using Ultramarine Blue and Quinacridone Red, and did the sketches directly with a watercolor brush. The orange is Pyrrole Orange, a color I am becoming quite addicted to!